While it can be hard to stay on top of all of the new watches that are released by the smaller brands (as there is not necessarily a pattern to the schedule), we do our best to stay on top of it. Of course, that is helped along by our relationships with those brands, as we generally hear about things in advance. One of those brands is of course Projects Watches. Today, we’re going to cover three watches that they have coming out this month. The first two of those come from their M&Co line (or are originally M&Co designs, however you choose to look at it). These are both of the Bodoni design, though the first one, the M&Co Pie watch, is the smaller one, coming in at 33mm (there is also a 40mm variant). Based on name alone, the Pie watch is perfect for November (aww yes, bring on the pumpkin pie!) This smaller watch features a steel case with a brass IP coating. Why pie? Well, that comes from the dial design. You see, the $140 M&Co Pie only features a pie-shaped wedge (from 9 o’clock to 12 o’clock) for the indices (minutes, hours, and 24-hour scale). Aside from the brand printed above 6 o’clock, that’s the limit of the printing on the dial. While this certainly is not the watch design for everyone, it certainly has it’s own look. Outside of those three hours of the day (well, twice a day), you’ll be approximating the time, but that’s something most should be able to do. If you like the looks of the M&Co Bodoni, but want something a bit larger (and a more complete dial) then the 40mm M&Co Bodoni is the one you want (if you like the smaller size, this one also comes in 33mm as well). Along with the larger case, you have a fully-printed dial, a handset that reaches to the edges of the dial, and a choice in finishes. While the Pie watch is only available in brass, the larger Bodoni is available in brass or a black finish, both running the same price, $149. And last, but not least, if neither of those designs do it for you, then have a look at the Mado watch. 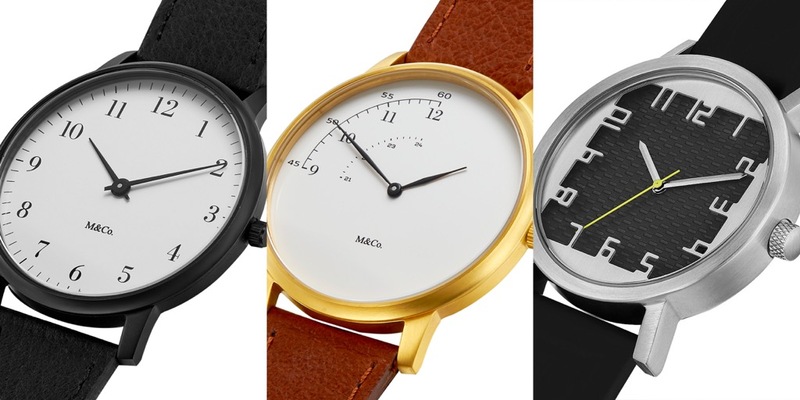 Like the Bodoni, the $135 Mado is also a 40mm watch. Rather than the classic round dial, though, here, we have a “square peg” sort of a look. More precisely, this is a Japanese take on a window, which is how we have the resultant square. This is pretty interesting, especially with how the numerals just out of the outer edges – it’s a clever look, and the lower insert gives some nice texture to the dial.